We managed to at least have a small rest in the morning, not having to wake up at 06:00 in the morning. The weather is great but still no wind so it looks like another motor trip down to Dover. We did not need to leave Ramsgate until 11:30 at 08:30 my Dad and me found ourselves in ‘Ship Shape’, a small breakfast café located on the marina front. If you ever go to Ramsgate this place offers a great breakfast for only £4.00. We took a walk into town to have a look around, I do think that Ramsgate seems to have more £1 shops than anywhere else I have been too and as I am no longer working I took complete advantage, whilst in the £0.99p shop I even managed to talk to two OPS’s about the extortionate prices of coke in Asda and Tesco compared to £1 land; I guess I am already turning into one of these people. So we departed Ramsgate at 11:30 in glorious weather to complete the 16.7 miles to Dover, our last South Eastern port. As expected it was a complete motor but at least the scenery improved as the white cliffs emerged from the sea. Pretty uneventful in all apart from dodging some lobster pots. 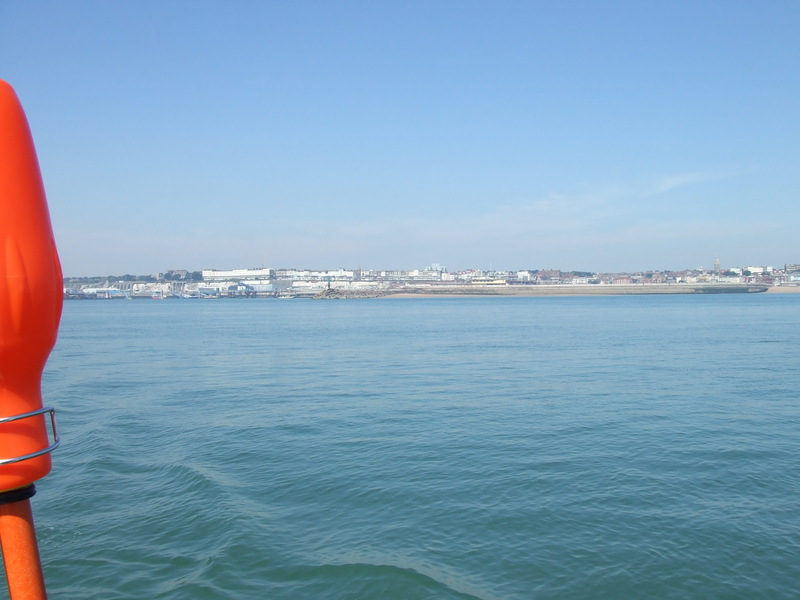 We arrived in Dover at 13:45 and used the tidal harbor, as we needed to depart at 05:00 the next day. We spent the afternoon walking around the town; the beach was packed with locals and tourists alike – a very British scene. I do not want to offend any reader but I do find Dover Town very depressing. The town in run down and in much need of re-development although it did have an Iceland so off we went to stock up Troskala for the next 4 days and walked the two miles with bags full of wine and cheap produce; I even managed to stock up on some Fray Bentos before Carlotta come back to join. Anyway, thank you all for reading and goodnight. Thank you Susan. I hope you are well. We hope to see you and Alex joining us soon. Safe sailing guys, keep up the blog posts! Cheers Ben. Tell me if it gets boring. See you next weekend in Studland.